Commodity currencies are generally under some selling pressure today. Australian Dollar is the weakest one as RBA took another step to laid the ground for rate cut by dovish minutes. RBNZ Governor Adrian Orr reiterated the central bank’s easing bias. Canadian Dollar was sold off overnight after poor Business Outlook Survey and remains weak in Asian session. On the other hand, Yen is paring some losses, but upside is limited by mild risk appetite in Asian stock markets. Swiss franc and Dollar follow as next strongest. Focus will turn to employment data from UK and investor sentiment in Germany. 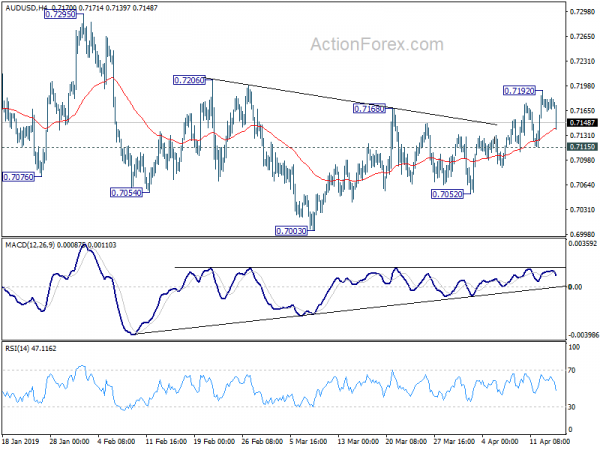 Technically, AUD/USD is holding well above 0.7115 minor support despite today’s pull back. Thus, more upside remains mildly in favor in near term. Despite overnight strong rebound, USD/CAD is held well in range below 1.3467 resistance and more consolidation could be seen before upside breakout. 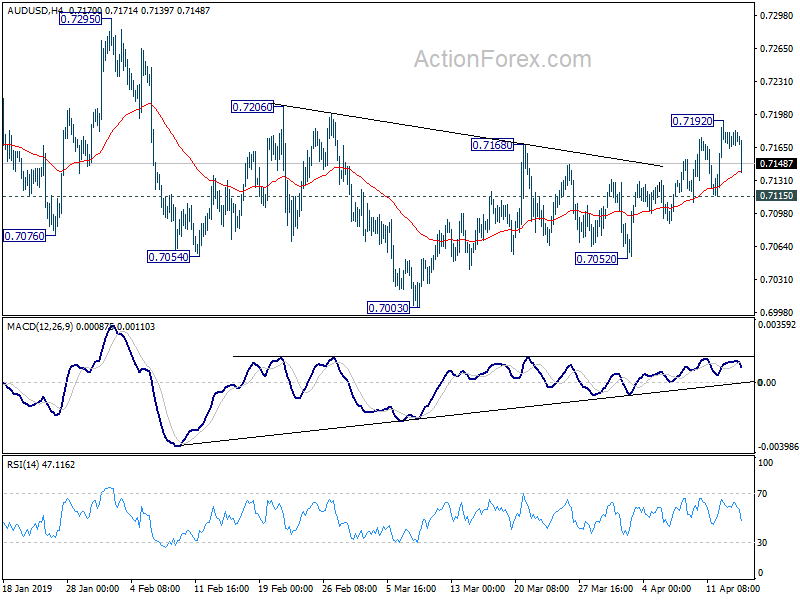 USD/JPY lost momentum ahead of 112.13 but retreat is so far very shallow. Focus remains on this key resistance for today. In Asia, currently, Nikkei is up 0.26%. Hong Kong HSI is up 0.63%. China Shanghai SSE is up 1.11%. Singapore Strait Times is up 0.15%. Japan 10-year JGB yield is down -0.0037 at -0.034. Overnight, DOW dropped -0.10%. S&P 500 dropped -0.06%. NASDAQ dropped -0.10%. 10-year yield dropped -0.007 to 2.553, comfortably above 2.5 handle. Australian Dollar tumbles sharply in Asian session after dovish RBA minutes set out the conditions for a rate cut. It’s seen as another step towards more monetary easing ahead, as markets are expecting two cuts this year. Nevertheless, “members agreed that there was not a strong case for a near-term adjustment in monetary policy”. It suggested RBA would wait-and-see, likely at least through Q2. RBNZ Governor Adrian Orr said today that monetary easing bias remains in place for now. And softer economic conditions in US, Europe and China are having a role in the dovish tone. Also, Orr added that “possibilities of first quarter inflation numbers being undershot have already being factored in the RBNZ’s dovish bias”. The comments came just ahead of New Zealand’s CPI release tomorrow. Headline inflation is expected to slow from 1.9% yoy to 1.7% yoy in Q1. 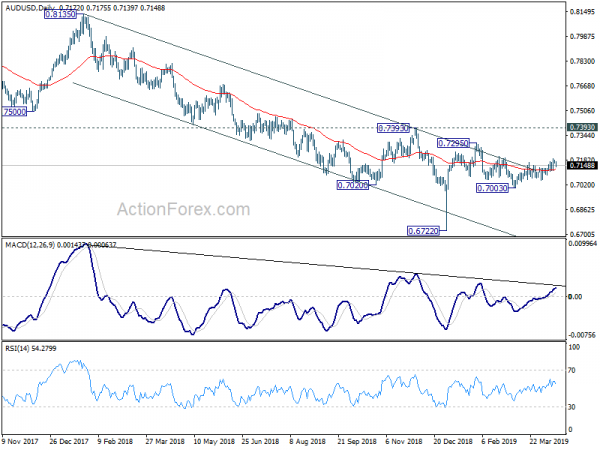 NZD/USD is a touch lower after the comments. However, Orr said that inflation undershot was already factored in. Thus, there is prospect of a mild rebound should tomorrow’s CPI release meets expectations. Canadian Dollar tumbles notably overnight after poor results of BoC’s Business Outlook Survey. Business Outlook Survey indicator dropped from 2.31 in Q4 to -0.64 in Q1. It suggested “a softening in business sentiment.” Also, responses to several BOS survey questions moved below their historical averages. BoC also warned that global trade headwinds and geopolitical tensions are affecting firms’ operations. Several respondents cited negative impacts on their outlooks from US policy changes and related uncertainty. Some firms reported impediments to their export sales resulting from US protectionism. Other respondents reported that US tax cuts and regulatory differences reduce their competitiveness vis-à-vis US firms. Several firms noted cost increases due either directly or indirectly to tariffs, notably those on steel and aluminum as well as those associated with Canadian countermeasures. Some firms noted that the US–China trade dispute weighs indirectly on their business. Chicago Fed President Charles Evans said on Monday that Fed’s policy has been “successful” in achieving the maximum employment mandate. It’s “less successful” regarding the inflation objective. And to fix this, he added, “Fed must be willing to embrace inflation modestly above 2 percent 50 percent of the time.” For him, he would “communicate comfort” with core inflation at 2.5%, as long as there is “no obvious upward momentum” while the path back to 2% can be “well managed”. Ahead of a broad review on monetary policy framework, Boston Fed President Eric Rosengren said he’d prefer a range targeting approach on inflation. That is, Fed could be forced to accept inflation below 2% during recessions. On the other hand, Fed should commit to achieve above 2% inflation in good times. For example a range of 1.5-2.5%. UK employment and German ZEW economic sentiment are the major focuses for today. Later in US session, Canada manufacturing sales and international securities transactions will be release. US will also feature industrial production and NAHB housing index. Today’s sharp retreat suggests temporary topping at 0.7192 in AUD/USD. Intraday bias is turned neutral first. Further rise remains in favor with 0.7115 minor support intact. On the upside, above 0.7192 will target 0.7206 resistance first. Break will likely resume larger rebound from 0.6722 through 0.7295 resistance. On the downside, though, break of 0.7115 minor support will turn intraday bias back to the downside for 0.7003/7052 support zone instead. In the bigger picture, break of medium term channel resistance is the first sign of bullish reversal. But there is no confirmation yet. As long as 0.7393 resistance holds, larger fall from 0.8135 is still expected to resume later. Such decline is seen as resuming long term down trend from 1.1079 (2011 high). Decisive break of 0.6826 (2016 low) will confirm this bearish view and resume the down trend to 0.6008 (2008 low). However, firm break of 0.7393 will argue that fall from 0.8135 has completed. And corrective pattern from 0.6826 has started the third leg, targeting 0.8135 again.